Oh happy day! 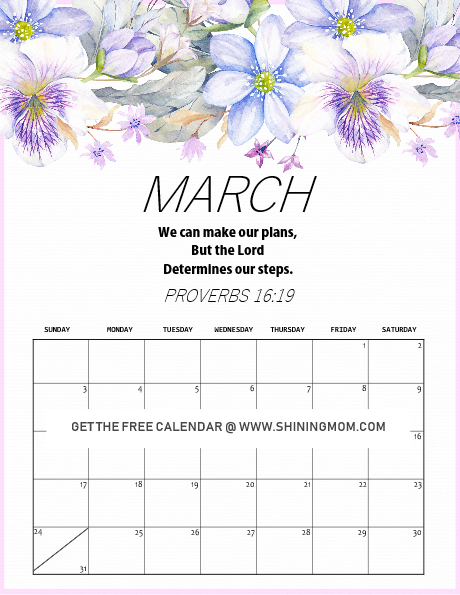 I am happy to announce that our free printable March 2019 calendar planners are released today. Choose from these beautiful designs that can all be printed for FREE! They are perfect to use to organize your plans, schedules, to-do lists, meals, budget and more. These calendars are your organizing must-haves! You can’t miss them! Hello, friends! 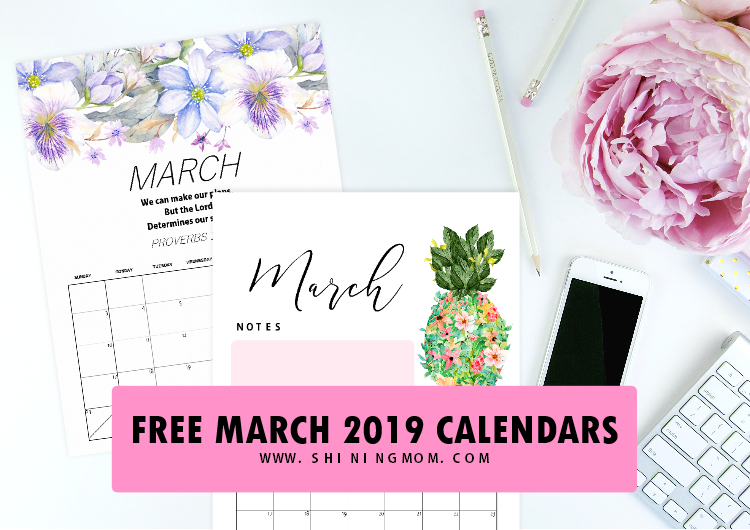 Have you landed on my monthly calendar series post looking for a free printable March 2019 calendar? No worries, I intended to release them early this time so you can already start planning ahead. I have a huge collection for you to choose for the month of March. I created 16 amazing designs in different themes, styles and format. 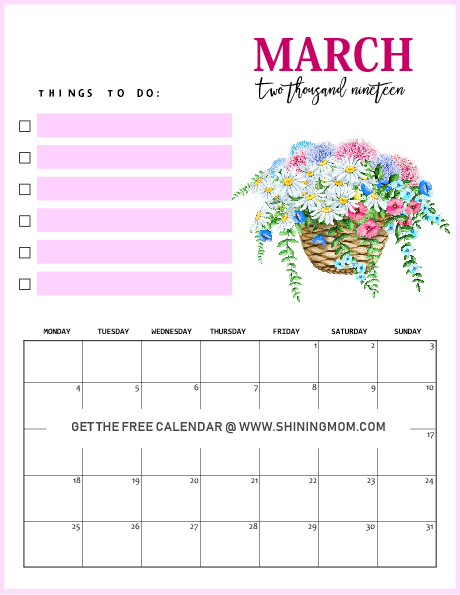 Here you’ll find floral calendars, calendars for kids, Monday and Sunday week start calendars, horizontal calendars, vertical calendars and more! 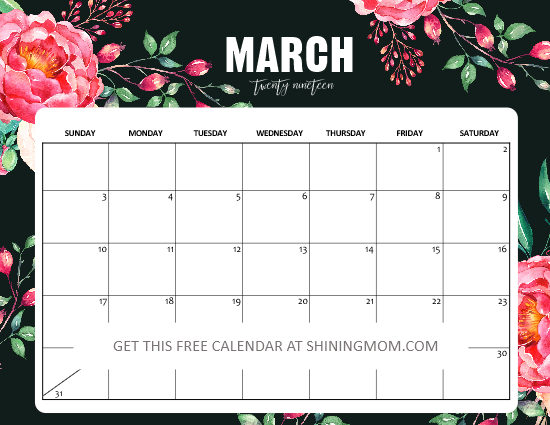 There’s a free printable March 2019 calendar design for everyone to love! Thanks to Design Cuts and Creative Market for some of the graphic elements I used in designing these calendars. Ready to view this month’s collection? Let’s start this quick calendar tour! 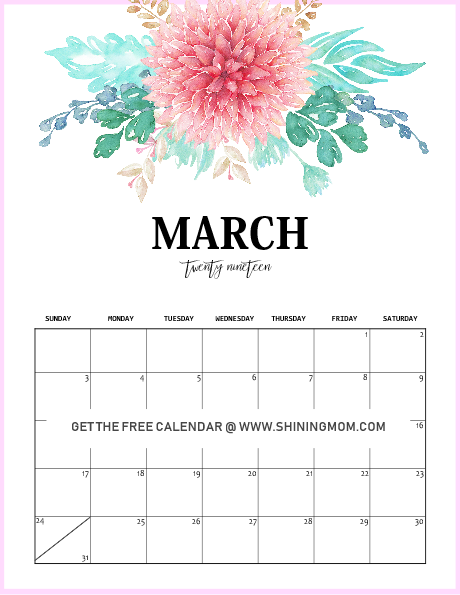 Free Printable March 2019 Calendar Planner: 16 Awesome Designs to Love! Sit back, relax and plan ahead. 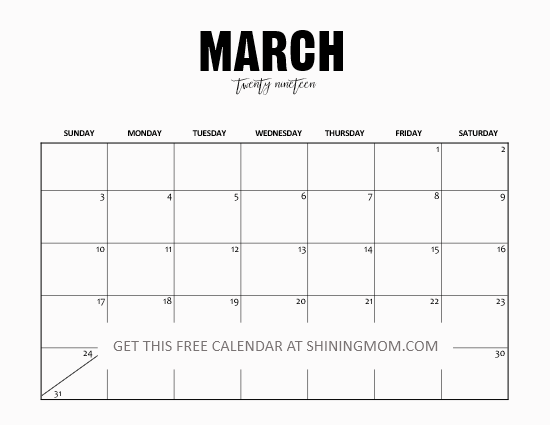 Here are the free printable March 2019 calendar planners that you can use right away. I pray that they will bless you by helping you keep that days ahead organized. productive and meaningful. Enjoy these freebies, friends! Let’s start off with this favorite calendar design of mine. I love that this design represents growth and great vibes! I also love that there’s a room for notes on top of the page where you can scribble reminders, goals for the month, bible verses or motivational quotes! 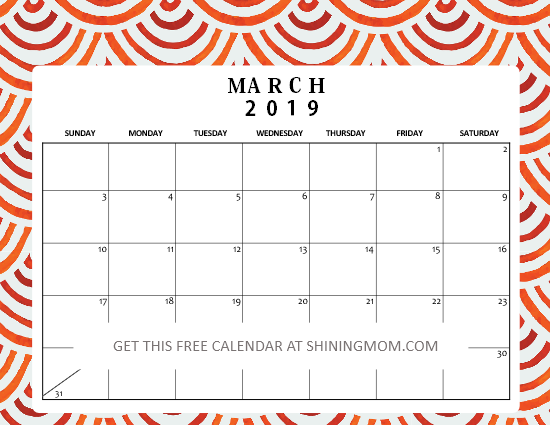 This free printable March 2019 calendar will inspire you to do great all through the month. And hey, should you be looking for a Free Budget Binder, I have released one over here that come in theme with this calendar. You can use them both for an organized and money-wise March! No other calendar can spell out sweetness than this! How I love the femininity of this particular design. Ahhh, it’s another must-print calendar from this set! Fun fact: This is the most loved Shining Mom monthly calendar design last year and you can clearly see why! The 3rd calendar that I am sharing away comes with bold flower designs in dark grey backcground. This is a great calendar to use by women who like to add some flower charm to their day. It’s so lovely! If you’re looking for a March calendar with Bible scriptures, you can immediately print off this next one that I have for you. It’s another calendar that’s absolutely stunning! Be inspired to commit your plans to the Lord as you walk through the month. Always remember that you are blessed! I have also created a calendar in green background that you can use! How I enjoyed combining these beautiful elements together to come up with a vibrant and refreshing calendar to use. You can print this for you coffee table and more. 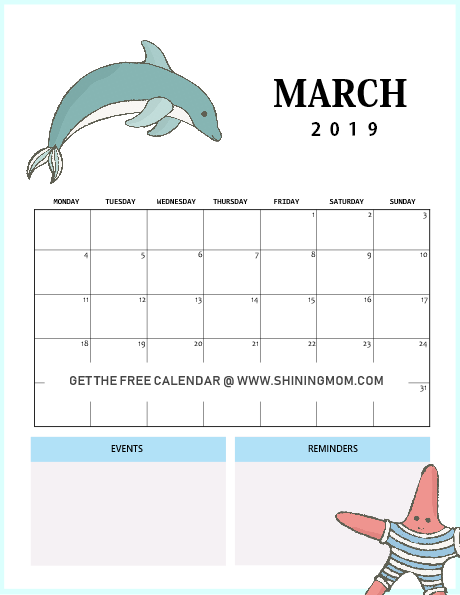 Next up are the free printable March 2019 calendars designed for the school kids. These calendar come in fun print and cheerful colors. Kids can use these calendars to get organized in school. These calendars are nice to have as school binder inserts. Check them out! This ultra fun calendar will immensely help the little ones get organized in school. They can use this calendar to write down the due dates of their homework and project and they can even use it to calendar their examination schedule, school events, classmates’ birthdays and more! In addition to the fun calendar above, here’s another cute one for the kids. It comes so cute and playful in bright print and color! It’s a horizontal calendar in Letter-size, perfect addition to school binders. The next calendars that I am showing you are modern and minimalist calendars with rooms for your notes. These calendars are for those who like clean and modern designs. Let’s check them out! Looking for a simple calendar with an amazing and useful layout? Here’s the one for you! Use this calendar to organize your schedule as well as the special events and reminders for the month. Great for home and office use. For those of you looking for a dainty and modern calendar, next up is for you. 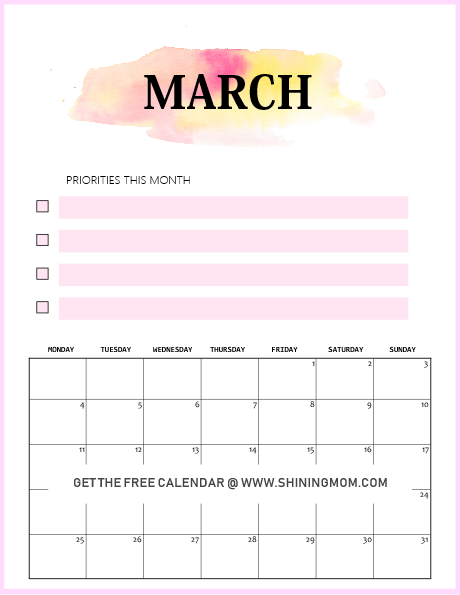 I have included an area where you can write down your priorities for the month so you’ll keep your eyes on the target all through out. 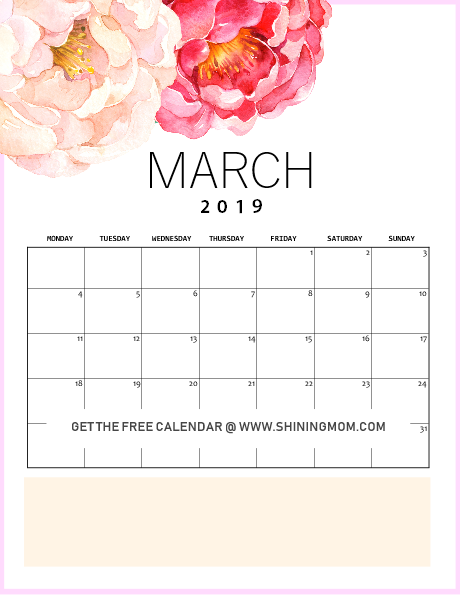 This next calendar that I have for you is a simple March 2019 calendar template in PDF. Should you like to snag the editable version in MS Word program, please go here. 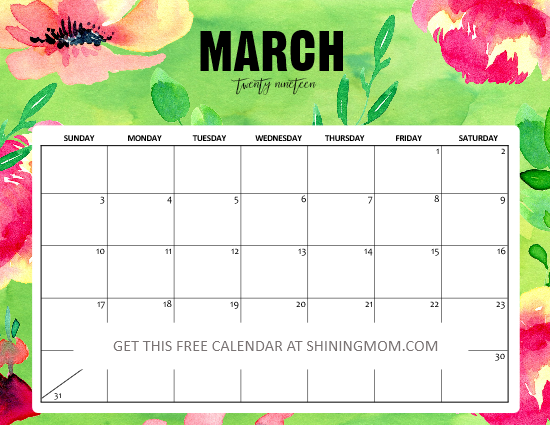 Free Printable March 2019 Calendar: Monday Start! Several of you have requested that I also release calendars that have Monday as the start of the week and so here they go! I understand that some of you can organize your week better in a Monday-Sunday calendar layout so you can easily spot your weekday and weekend tasks . Several moms and office workers prefer this calendar style. The next ones are then for you! Easily list down your monthly major to-do’s right in this March calendar planner! And yup, it’s a Monday week start calendar that comes really pretty. Print this for your home and office use. It will surely help you get things sorted out. Moving on, the next calendar that I am sharing with you is again one of my favorite designs from this set. It looks clean ans sweet. It’s the kind of calendar that will inspire you to do all things beautiful all through the month. Oh, the pink box at the bottom of the page is intended for your notes! This will land on my work desk. How about you? 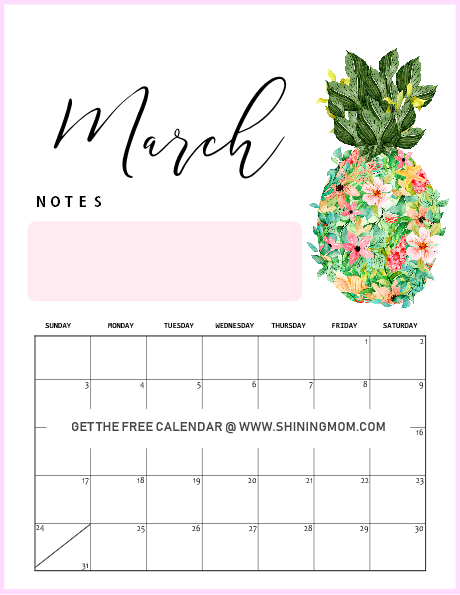 GET YOUR FREE PRINTABLE MARCH 2019 CALENDAR PLANNERS + PRINTING REMINDERS! Instantly download the calendars in horizontal orientation. Click here to download the 6 calendar files. 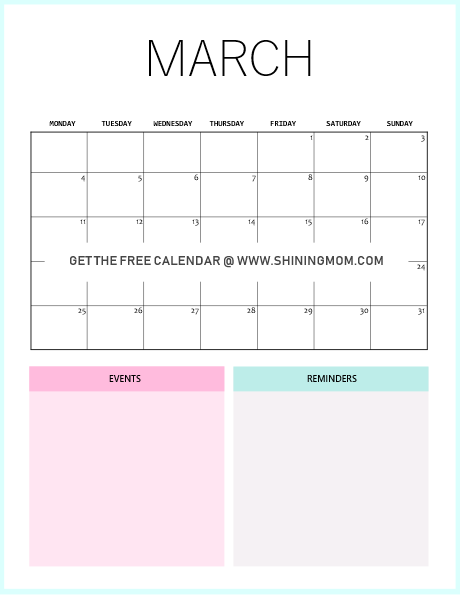 Join the Shining Mom mailing list to receive the calendars in vertical orientation. Click here to receive the 10 printable files. Feel free to print as many copies as you need for as long as they’re for personal use only. Print the calendars in US standard Letter Size paper with 8.5″×11″ dimensions. No time to print the calendars yet? Save this post for future use. Pin this post on Pinterest! Will you be using the calendars I’ve just shared? Please let me know at the Comments. I’d love to hear from you! Happy planning and have an amazing and blessed March! « 50 Best 2019 Planners in PDF to Print: All Free & Pretty!